Hi, I am interested in your 1970 Chevrolet C/K Truck (stock #4901-CHA) listed on Autotrader for $29,995. I'd like to get more information about this vehicle and confirm its availability. This is the kind of truck to get excited about. 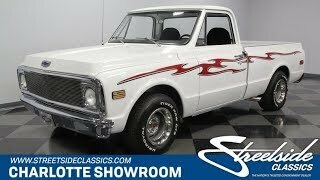 This 1970 Chevrolet C10 pickup has a cool look, plenty of extras, and oh yeah, a performance-built V8 thats supercharged AND has a nitrous oxide system. So this is putting some serious muscle on the street. While the motor already has you hooked, take a moment to look at all the other ways this truck impresses. The bright white paint and straight sheet metal are a great canvas for the custom bold red and black graphics running the full length of the truck and on the tailgate. Its even on top of the hard tonneau cover! And the details are nice, too, with upgraded headlights, side exhaust tips, blue-dot taillights, and all the bright work from the deep-dish Rally wheels to the billet grille. Inside are more great upgrades. It starts with cloth seating thats far more comfortable than what you got in the 70s. There are a set of plush buckets with an armrest/cup holder center console. And this folds up if you need to carry a third person in a pinch. Plus, theres an AM/FM/cassette stereo with digital tuner. But your real favorite upgrades are the ones that give you the extra tingle of performance. Upgrades like the Grant sports steering wheel on a chrome tilt column, and the full digital gauge trio form-fitted to the dash let you know theres something special under the hood. You already know theres plenty of power under the hood, but the builder made sure everyone was going to want to see it, too. Thats thanks to all that extra bright work in this very tidy setup. This V8 was built by Joey Brooks Racing, so it was made to handle the extra go-fast goodies. Most people would love to just hear about the Weber four-barrel carburetor, but really, its the Weiand supercharger thats like a big bright beacon calling others to take a look at this pickup. And when thats not enough for you, the nitrous bottle mounted in the covered truck bed can deliver that extra hit of power that will blow everyones doors off. Oh yeah, this is a full package estimated to produce over 500 horsepower! On the road, its your choice to keep this one mild or wild, because the TH350 three-speed automatic transmission is smooth and comfortable when you want it, and its stout enough to take on the supercharged power at a moments notice. Plus, you have power steering, power brakes, and the C10s sought-after trailing arm rear suspension. If you cant decide between the ultimate muscle machine and a great vintage truck, this supercharged Chevy gives you both. When something this unique is also quite obtainable, you know you have to act quickly to take it home. Call now!